Epoxy Coating application takes numerous forms and has endless applications ranging from highly reflective monolithic single color coatings to multicolored decorative systems to broadcasting grit for increased traction. Providing increased chemical and stain resistance with increased durability, Epoxy Coating is an affordable option to refresh and renew the appearance and functionality of your floor. 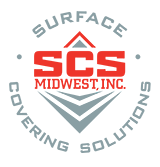 With over 30 years of successful projects, rest assured that SCS Midwest Inc. is fully capable of diagnosing the problems plaguing your floor and presenting you with an appropriate system to resolve your flooring issues.